I stand on the platform and look down two hundred feet (60 metres), approximately the height of a 17 story building, at the surface of the water. For the briefest of moments, part of my brain says, "This is so not right." I ignore myself and listen carefully as the handlers count down then shout, "Go!" I take a breath, spread my arms, shift my weight forward then give a little push with my knees and go into a swan dive. It takes approximately three seconds to fall, three seconds of weightlessness before the elastic stretches to its limit and slowly rather than abruptly stops my descent. The handlers know their work and have done the estimates accurately. I had asked to not be dunked in the water but to merely graze it. I have my arms stretched over my head in a diving position and my hands splash the surface of the water. Then the elastic pulls me back up in the largest bounce of the jump. In looking at others, I'm guessing I am pulled back up to over the halfway mark, a hundred feet or so, before I fall once again in a series of ever smaller bounces. Finally I am hanging upside down over the water and they lower me slightly so the pick-up guy in an inflatable Zodiac boat can grab a hold of my hands. As the handlers above lower the cord, the pick-up guy guides me into the boat onto my back with my feet up. He detaches the cord from my ankles then has me sit up to assist in getting out of the harness as he takes me to shore. It's over. I have done my first bungee jump. Overall time? They tell me they can do jumps every five minutes so while the waiting can go on for some time; the actual jump itself is over in a twinkling of an eye. In fact, this happens so fast, I admittedly did not appreciate what was going on during the jump. The handlers told me what to do and I did it all without reflecting on the experience. Canadian Bungee Jump is located just outside of the small community of Wakefield, Quebec and bills itself as the tallest bungee jump in Canada. It is located in an old quarry. From their web site: Visualize an amphitheater of solid limestone, 200 ft. high, surrounding a 160 ft. deep aqua-blue, spring-fed lagoon, larger than 3 football fields. It is a spectacular scene. The jump tower is built on the one side with a supported walkway extending over the middle of this mini-lake. You sign-in at the main office down below, filling in the necessary waivers – where to send the body, etc. – and get yourself weighed. The woman at the office writes your weight on the back of your hand in magic marker. At this point you wait around until your name is called. They take you up in groups and line you up on the walkway to get you prepped as then you jump one after another. I was told they jump every five minutes sometimes starting as early as 6am and going to sunset. They have done nearly 200 jumps in one day. Apparently this is a very, very popular attraction. I had signed up over the Internet and got one of their packages which included the bungee jump, the Ripride, a video and a t-shirt. Hey, done that, got the t-shirt! Shortly after my arrival, they decided to do my ripride almost straight away so this turned out to be my bungee warm-up. I would classify the ripride as ziplining on steroids. Ziplining involves hanging suspended from a cable with a pulley system and sliding from a higher point to a lower point. I had done ziplining years ago on the island of St. Lucia in the Caribbean during a family cruise and found it to be amusing. Of course, that attraction was in the trees and seemed somewhat tame. Subsequently, I discovered some ziplining is done over gorges or other high places which would make it far more exciting. This ripride goes over the quarry at a height of about hundred feet (30 metres) and they claim you go at an average speed of 80 km/h (50 mph). With ziplining, you normally are suspended in a seated position but for this ripride, they had me suspended from my lower back as if I was Superman flying. It was fairly exciting, especially when you come off the platform and suddenly the ground drops away and you are over the lagoon. But as I said, this was just the warm-up to the main event. During my two hour wait (my times got mixed up and I showed up early), I had the opportunity to watch over twenty other people jump. A busload of university students arrived and because they all knew one another, they seemed to be having a gay old time, laughing, applauding, and swapping stories of their jumps. You have the option of being dunked in the water or not. A few of them elected to do this and they ended up upside down in the water up to their waist. Keep in mind, this was on the initial bounce when the cord is stretched to its maximum so they remain in the water for only a split second. The standard way of jumping is secured by your ankles so you remain upside down. You can opt to be tied off at the waist so you jump in a seated position. A few of the students opted for this but I'm not sure it's any less scary. As I said, they all knew one another which I think contributed to their yelling. That part of it was hilarious as some of them jumped and screamed their heads off. The crowd was laughing uproariously. The handlers give each person a countdown then yell, "Go," however a few jumpers hesitated and had to get several countdowns before they mustered the courage. One poor girl must have been up there for a couple of minutes being talked through about four countdowns. After waiting for two hours, my name was called. (By this time, I just wanted to get it over with.) My group trekked by foot up the hill to the base of the tower. You walk up the stairs and end up with a breath-taking view of the countryside in all directions. You also have a startling perspective on what you are about to do. Two hundred feet (60 metres) doesn't seem like much until you are standing looking at it from above. This is not right. This is not normal. If God had meant me to jump, my umbilical cord would still be attached. Yes, you intellectually accept the safety procedures. Yes, you've already watched others do it and there has been no mishap only a fun time. Nevertheless, your heart is pounding whether you are aware of it or not. Your mind reels from the idea of jumping into space. As I waited my turn I promised to ignore what I was feeling and follow what the handlers said to the letter. In other words, don't think, just do as instructed. When they said "Step forward," I would step forward and when they said "Jump," I would jump. I move up in the line and a handler gets me into a harness and asks me my preference: by the ankles or the waist. I choose the standard, by the ankles. I want the full treatment. The handler calls me forward and I walk the long walk to the end of the boom over the quarry. He gets me to sit down and put on the ankle bracelets and finishes tightening all the straps. Another handler takes my weight and calls out, "Number 28." He asks if I want to be dunked. I tell him, "No dunk but can you let me touch the water?" He chuckles saying that I'm asking him to prove how good he is. The first handler finishes then the second handler comes over and removes the safety line. He then systematically goes over every strap double checking their tightness and calling out what he's doing to the others. He has me stand up and waddle over to the jump platform. They swing the safety door out of the way and I put my feet to the edge. I hold onto hand railings and look down into the cavernous bowl of the quarry at the surface of the water. I am high, like really high. I have merely a moment during the countdown to mull over my position. A wave of sheer utter terror passes over my consciousness. The handlers all yell, "Go," and I jump. The rest of the jump is a blur. Things are happening fast, really fast, and I am quite disoriented. I am falling, being pulled back up, bouncing around, and am not sure of where I am in the midst of the jump. Things calm down after the second bounce and I start to merely bob while hanging upside down. Now I get a better grasp of being over the water and the pick-up guy manoeuvring under me. From my jump to the pick-up, it has to be less than 60 seconds. As I lie in the bottom of the boat while the guy unties my ankles, I realise I am wound up tighter than a clock. I can feel the tension in every fibre of my core. Later on I will see people write on the Net of the "bungee rush" and that certainly is it. Well, either that or the start of a heart attack. As an aside, I did research bungee jumping before I signed up. Like my parachute jump, I discovered that we all seem to be scared out of our wits by these seemingly dangerous sports when statistically, they are safer than driving a car. Accidents in cars are so commonplace, we no longer pay attention to them. Accidents in these extreme sports are statistically rare but that rarity means those accidents usually end up in the newspaper solidifying our mistaken impression these sports are more dangerous than our everyday activities like driving a car. Why do I do this to myself? Ha, ha. Forty-eight hours before the jump, I realise I'm preoccupied. Twenty-four hours before the jump, I feel tense. I get up the day of the jump and wonder if I can intelligently string words together to make coherent sentences. (Yes, "oh my God" is three words. Ha ha) I keep reminding myself that adrenaline junkies do this for fun. Fun? Scaring yourself to the point of peeing your pants is fun? Is there a bit of masochism in this? Self-flagellation? At least I have photographic evidence of having done this so that means I now have permanent bragging rights. Like parachuting, there is no goddamn way you'll get me to do this again. I remember reading somewhere that facing your own death makes you feel more alive. I'm not sure about that but I kid you not, I brought a change of underwear. Mister macho tough guy? I want my mommy! 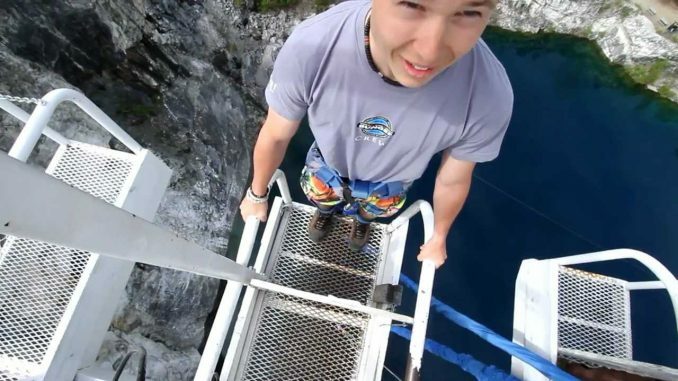 Video from the company Great Canadian Bungee that shows a jump from swveral different angles. It also show a bit of the ripride. Cool! This jumper is wearing a helmet cam. Ha ha ha. This is better than the video I paid for as it shows you exactly what I experienced. Please keep your hands in during the ride. Ha ha. Wow. Like really wow. Bungee jumping (also spelt "Bungy" jumping)] is an activity that involves jumping from a tall structure while connected to a large elastic cord. The tall structure is usually a fixed object, such as a building, bridge or crane; but it is also possible to jump from a movable object, such as a hot-air-balloon or helicopter, that has the ability to hover above the ground. The thrill comes from the free-falling and the rebound. When the person jumps, the cord stretches and the jumper flies upwards again as the cord recoils, and continues to oscillate up and down until all the kinetic energy is dissipated. Wakefield is one of many villages of the Municipality La Pêche, Quebec on the western shore of the Gatineau River, at the confluence of the La Pêche River in the Outaouais region of Quebec. The village, named after the town of Wakefield in West Yorkshire, England, is now the southern edge of the municipality of La Pêche, and was founded in 1830 by Irish, Scottish, and English immigrants. It is approximately thirty minutes from Gatineau and Ottawa, Ontario driving north on Autoroute 5 and Route 105 at Route 366. Google image search: "Great Canadian Bungee"
YouTube video search: "Great Canadian Bungee"
my blog: Edge what walk are you crazy? I look down. The ground is 356 metres or 1,168 feet straight down and the only thing stopping me from an approximate ten second drop to my death is a steel cable my guide assured me could support the weight of an elephant and a half. I did it. (Gets out a pen and strikes out another item on his bucket list) Before moving on to my next (so-called) dangerous activity, I thought to regale you with tales of crash and burn, er, crash and splash. From the 1995 James Bond film Goldeneye: The opening 220 m (720 ft) bungee jump at Archangel, shot at the Verzasca Dam in Switzerland and performed by Wayne Michaels, was voted the best movie stunt of all time in a 2002 Sky Movies poll, and set a record for the highest bungee jump off a fixed structure. … The dam owners started to lease access to the dam, soon after GoldenEye was released, to a commercial bungee jump operator. According to the operator, over 10,000 people have jumped the 220 m (720 ft) from the dam.